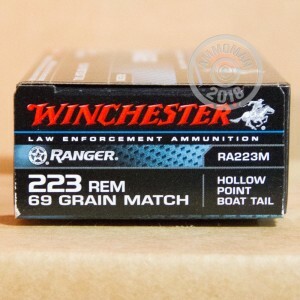 Winchester Ranger ammunition was designed to serve the needs of the law enforcement community, but makes a great self-defense load for all owners of .223 rifles and does a number on small to midsized pest animals as well. 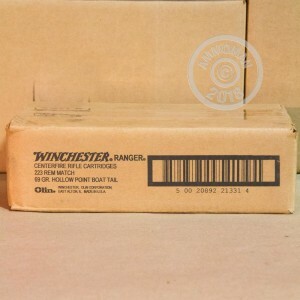 Manufactured at Winchester's newest ammo facility in Oxford, MS, these cartridges fire a heavy 69 grain boat-tailed hollow point bullet at a muzzle velocity of 3,060 feet per second. 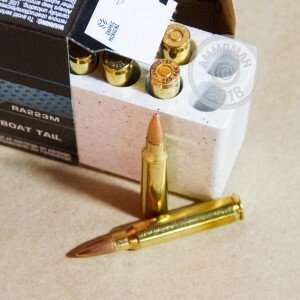 The added stability provided by this bullet gives these rounds a little more reach than your typical .223 load. This ammo is loaded to match-grade specifications and doesn't come quite as cheap as range-grade FMJ ammo. Picking up this 200 round volume priced case helps keeps your costs under control, and AmmoMan.com makes the deal even better by providing free shipping for all orders over $99, regardless of the actual freight cost!